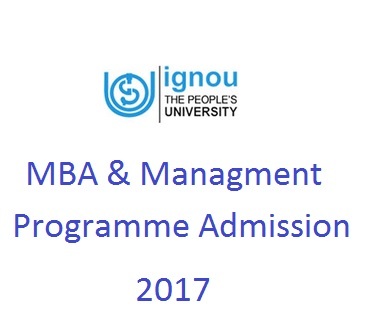 IGNOU - MBA & PG Diploma Admission 2017 - OPENMAT-XL 2017 - What is the Eligibility? How to Apply? Want to do MBA & other PG Diploma and Management courses in IGNOU for the academic session 2017-18 then please note down Indira Gandhi National Open University invites application for the below courses for the session 2017 by OPENMAT-XL Entrance Test. How to Get Admission in Management Courses? You can get admission in MBA, DIM, PGDIM, PGDHRM, PGDFM, PGDOM, PGDMM, PGDFMP by passing Entrance Test 'OPENMAT-XL' which will be held on Sunday, the 23rd October, 2016. OPENMAT-XL is entrance test exam which is conducted by IGNOU (each year) for the Management courses. What is the Eligibility (Education Qualifications)? Graduation in any discipline with 50% marks for General Category / 45% for Reserved Category, with 3 years managerial/ supervisory/professional experience. Professional Degree with 50% marks in: Engineering/Medicine/Chartered Accountancy (ICAI) / Cost and Works Accountancy (ICWAI)/ Company Secretaryship (ICSI)/ Law. Is it Necessary to Clear OPENMAT for Getting Admission in MBA & Other PG Courses? Yes, Clearance of OPENMAT 2017 is must. Last date to apply is 9th September, 2016. How to Get Student Handbook & Prospectus for Management Programme - 2017? 'Student Handbook & Prospectus for Management Programme – 2017 can be obtained from the Director (SSC), IGNOU, Maidan Garhi, New Delhi- 110068 or from any Regional Centre of IGNOU by sending a sum of Rs. 1050/- through a Demand Draft/IPO in favour of IGNOU payable at New Delhi/city of Regional Centre concerned or by paying Rs. 1000/- in cash at the respective sales counters. Please write your name and address on the back of the DD/IPO. Last date for receipt of request for 'PROSPECTUS' by post is 30th August, 2016. How to Get List of Addresses of Regional Centres Concerned? Good Luck for your OPENMAT Entrance test. If you are looking for previous year old question papers for OPENMAT or MBA entrance test exam papers and want to share with others then you can comment here.